Although Editor Edwin H. McLaughlin published The People's Paper in Concord for at least seven years (ca. 1872-1879), only one issue, September 27, 1879, survives. The newspaper masthead notes that the 1879 paper was volume VII (indicating at least seven years of publication), that the paper was published every Saturday morning, and that an annual subscription cost $1.50. Newspapers of the day were extremely political, usually the voice of a particular political party or viewpoint. An editor depended on state, national and international news to fill his pages; generally, local news comprised one or two pages devoted exclusively to personal and church items, social events, and legal and commercial advertisements. The progressive The People's Paper followed the same formula. Among the advertisements in the September 2, 1879 issue are these two real estate notices. Note in both advertisements that a good well and good water supply are key selling points, as are the existence of barns and other out buildings. Without city or county water systems, a well was a necessity, even in town. Any house that did not include a good barn for the family horse and wagon was not a very good buy. Historic marker which stands on Mooresville Road in Cabarrus County. at Chapel Hill, Photograhic Archives. Mill Hill Plantation, located in what is now Kannapolis off of Mooresville Road, is a historic house built by master craftsman Jacob Stirewalt in 1821. It was placed on a high spot overlooking a stream where Stirewalt eventually built a series of mills. One of the earliest and most architecturally important Greek Revival homes of the South, Mill Hill features both Federal and Greek Revival styles. The home's most impressive feature is a full porch with fluted Doric columns and stylized entablature. An interesting original furnishing of the home was a pipe organ featuring ninety-three hand made pipes painted in bright colors. It was one of the first to be installed in a private home. After leaving the newspaper, The People's Paper editor, Edwin H. McLaughlin, moved with his family near Knoxville, Tennessee, where he was a minister. Sadly, he died in 1905 at the age of 49 from pneumonia. He left behind his wife, Ida, and eight children. The September 27, 1879 issue of The People's Paper is available at the North Carolina Archives. Immannuel Lutheran College, founded in 1903 by the Missouri Synod of the Evangelical Lutheran Church of North Carolina, was first established in Concord, NC. Starting with only five students, for nearly three years it occupied rooms in the parochial school building of Grace Lutheran Church. The first president was N. J. Bakke, who served as president from 1903 to 1910. The institution offered high school and two-year college curriculum to African American men who intended to enter the ministry or engage in missionary work. Shortly thereafter, women were also admitted to the college. 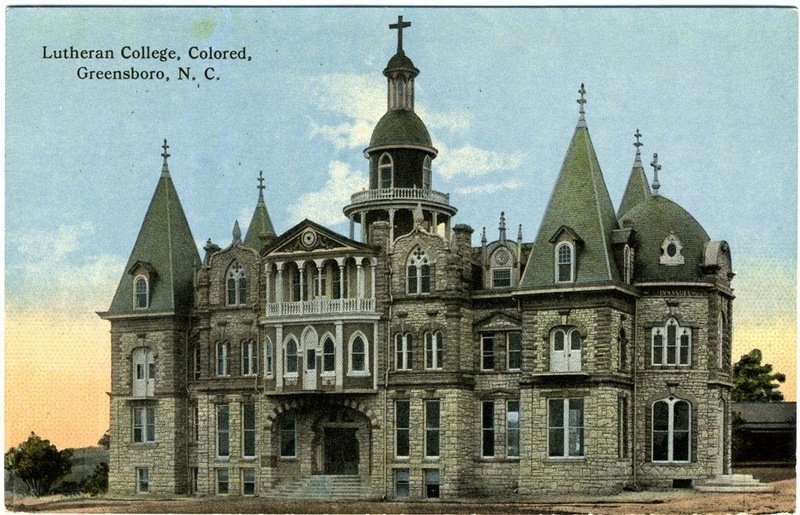 In the fall of 1905, Immanuel Lutheran College moved to Greensboro, where for two years it occupied temporary lodgings, and then moved to a thirteen acre property donated to the school on East Market Street. It had its first graduates in 1907. The creation of a school to train black ministers was a boon to the Lutheran Church in North Carolina since black leadership led to the creation of new congregations and revival of older ones. 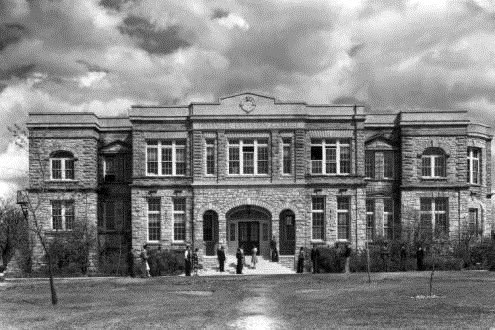 The permanent building (shown above) was described in the 1909 school catalog as, "The building (two stories with a roomy attic and basement), is built of Mt. Airy granite with cement trimmings. It is a massive, imposing structure, noble and pleasing in architecture and beautifully situated on an elevation overlooking the city to the southwest." Additions in 1927 and extensive repairs and remodeling in 1932 drastically changed its unusual, German-style architecture. The subsequent history of the school, until its demise in 1961, shows no other obvious ties to Cabarrus County. When the school closed, a result of changing attitudes about segregated education, North Carolina A & T State University bought the property; none of the buildings stand today. 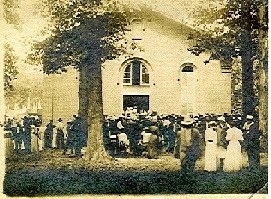 Rocky River Presbyterian Church, 1912. OBITUARY: Departed this life, on the 29th ult., at the house of John B. Moss. Mr. Archibald Neely, a graduate of Davidson College, in the 25th year of his age. Mr. Neely was born and raised in Rocky River congregation and from his earliest years was remarkable for a benign and pleasant disposition. He received his academic course of studies at Rocky River academy under the instruction of Mr. Robert J. McDowell and early developed a rare talent for close application and deep study. In all his studies he stood at the head of his calass both in his Academic and Collegiate course. At an early period of his life he made a profession of religion and joined the church at Rocky River under the pastoral care of the Rev. D. Lindly. At an early period of his life, the writer of this had a good opportunity of witnessing with what industry he applied himself in searching scriptures. There were few students in the writer's Sabbath School class that understood the scriptures better (of which class there are some four or five now Ministers of the Gospel.) Mr. Neely had intended on leaving College to enter on his studies for the Ministry, but on his return to his father's, he found his father's mind so impaired as to make him incapable of managing his affairs - and about the same time he lost his only brother who could have attended to his father's affairs. Having settled his father's business and placed it in such a way that he was released in a measure from that business, he had taken a school in the vicinity of Poplar Tent church, with a fair prospect of raising funds to enable him to pursue his studies in Divinity in some Theological Seminary; but alas, death had marked him for his victim, and in less than ten days from his attack, he was in his cold and icy arms - his disease was typhus fever. Mr. Neely was a young man of genuine piety, was plain and unassuming in his demeanor and in his last sickness his prayers were continually ascending to his Savior. He was truly lovely in his life - there were few who knew him but loved him; but he has gone to his reward in Heaven. The October 1842 Cabarrus Court of Pleas and Quarter Sessions granted special administration for Alexander N. Neely to Archibald Neely, but not until January 1843 did the Court indicate Alexander was deceased. Alexander may be either Archibald's "only brother" or his "impaired" father. The Rocky River Presbyterian Church Register also shows John Neely, removed by death, October 17, 1868. Archibald himself was dismissed June 4, 1837, "to help form church at Davidson, NC." 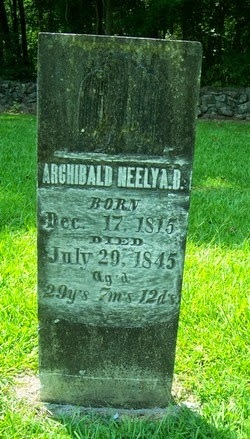 The inscription on Archibald Neely's stone is: Archibald Neely, A. B., b. December 17, 1815, d. July 29, 1845. The letters "A. B." in the inscription surely stand for Archibald's Davidson College degree (Latin “artium baccalaureus,” Bachelor of Arts), an unusual accomplishment for the period. Today marks the opening of the Cabarrus County Fair, which runs through next Saturday, September 13. Generations of Cabarrus residents have enjoyed the fair, which has its roots in the early county agricultural fairs of the 1870s. The fairs were a way to exhibit agricultural products and teach people about new farming methods. One was held near Poplar Tent Presbyterian Church in Concord and another was held at St. John's Lutheran Church near Mount Pleasant. In the late 1880s, the two fairs combined to form the Agricultural and Mechanical Fair Association, which constructed fairgrounds near downtown Concord in an area bordered by Union Street, Spring Street, Blume Avenue and Tribune Avenue. That fair closed in the 1890s and wasn't reorganized until 1923, when the fair moved near the intersection of U. S. 29 and Cabarrus Avenue in Concord. While there, horse races drew huge crowds. The fair closed again after the 1934 season, suffering from a lack of funding brought on by the Great Depression. It wasn't until 1953 that the County Fair resumed. Planned and financed by an independent fair board, it has since been an annual event. In 2002, the fair became a county operation. That same year, the fair moved to its current location at the Cabarrus Arena and Events Center. The early county agricultural fairs were especially important to Cabarrus residents when leisure time and recreational travel were hard to come by. The 1891 Fair gave people from all over Cabarrus an opportunity to enjoy exhibits, compete for blue ribbons and meet their neighbors. In an article on September 3, 1891, the Concord Standard editor urged his readers to participate, saying, "We have one of the best counties...let everybody do a little, and you will see as good a Fair as any in the State." From all over Cabarrus, men, women and children helped out. Twelve ladies formed a committee to arrange the floral and dairy exhibits; members included Laura Tucker, Ida Burleyson, Kate Robinson and Mollie Fetzer. Men who served as Marshals included Elam Cruse, Henry J. Ritchie, W. F. Moose and D. D. Barrier. Sixteen boys served as Boy Marshals, including Paul Parks, Shakespeare Harris, Jr., Watt Rankin and Stanhope Caldwell. Special delegations from Mecklenburg and Stanly Counties attended and all the railroads in the Carolinas advertised special rates good for Fair Week. Round-trip fare from Charlotte or Salisbury was 65¢ (about $16.60 today); from Greensboro, $1.50 ($38.31); Durham, $2.60 ($66.41); and Raleigh, $3.20 ($81.73). The sixteen-member Third Regimental Band of the North Carolina State Guard performed in full-dress regulation uniform. Another big attraction was a race between George Murr, "the finest runner in the country," and M. J. Corl's "race horse"; Murr ran a quarter mile to the mule's half-mile. Unfortunately, the Standard does not say who won! No fair is complete without its list of blue-ribbon winners; in 1891 G. H. Barnhardt had the best bushel of May wheat and R. A. Brown had the best and largest exhibit of cattle. Mrs. G. E. Ritchie had the best butter, G. W. Petrea the best peaches and J. M. Fisher the best apple cider. Mrs. P. B. Fetzer won best silk embroidery, Miss Elina Cole the best specimen of lace, and Miss T. M. Dunn best and second best oil paintings. In the words of the Standard, the 1891 Cabarrus County Fair was a "great and powerful success!" Today's Cabarrus County fair continues to be a big success. Go and enjoy the fun, food and rides and become part of the tradition! Now that Labor Day weekend has past, it is time for Cabarrus County students to settle into the new school year. Here we take a look at a brief overview of Cabarrus schools in the early 20th century. 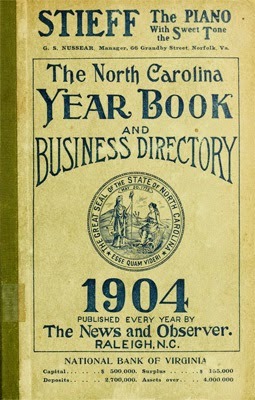 The "North Carolina Year Book and Business Directory, 1904," published by the News and Observer of Raleigh, listed 71 teachers in Cabarrus County for the year. It appears the many of the students attending school lived in Concord since 29 of the 71 teachers taught in Concord. Schools in the county included Mt. Pleasant, Bost's Mill, Enochville, Gold Hill, Carriker, Glass, Georgeville, Clear Creek, Coddle and Flows. Among the county school teachers were Miss Mabel Barrier, Miss Maggie McAllister, Robert L. Hartsell, Miss Anis Eudy, Miss Emma Lipe, Miss Ada Lentz, H. C. Cook, Miss Bessie Newell, Miss Maggie May Rogers, Miss Carrie Presson, Mrs. M. V. Pethel, Misses Cora and Ada Isenhour and W. T. Albright. Notice that all of the female teachers except one were single ladies. Teaching was not an occupation for married women, most of whom did not work away from home in those days. The Year Book also listed several schools and academies by name: Rocky River High School, Georgeville High School, Sunderland Hall for Girls, Concord High School, Mrs. Erwin's School for Children, Scotia Seminary, North Carolina College and Mont Amoena Seminary. As County Superintendent of Schools, C. E. Boger oversaw the operation of the county schools; the City Public Schools Superintendent for Concord was Walter Thompson. "The North Carolina Year Books" contain many interesting facts about the state and its counties. They include lists of physicians and attorneys, ministers and churches, mills and markets, hotels and boarding houses. Copies are available at the Concord Library, Lore Local History Room and digital listings are at http://ncgenweb.us/nc/bookshelf/directories/ and Archive.org .